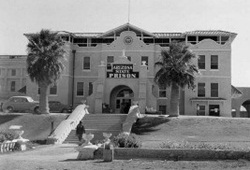 Arizona State Prison Complex Florence is made up of six individual facilities. Inmates at Florence can be located in Central unit, Kasson, East, North, South and Globe. All of the units with the exception of East over basic adult education and have a GED program. East unit has a focus on reducing domestic violence and centers around shaping the way offenders think to try an lower aggression and impulsive behavior. East also offers a parenting class, poetry workshop, and re-entry for inmates preparing for release. Globe and South unit have the most vocational programs. Globe has a forestry work program as well as waste water, fire crew, landfill crew, barber, tailor and kitchen vocational classes. South unit offers construction, and fabrication in metal and wood classes. Visiting hours are divided up by both unit and the custody/internal unit of the facilities. Visitation at most of the units change frequently and require you to schedule a visit at least 24 hours in advance. Because of this you will need to contact the institution if you plan on visiting an inmate.